This week was a little busy again. I have been getting quite a bit of cleaning done lately around the house with the 30 Day House Cleaning Challenge. My house is looking really good and I love that each task only takes about 20 minutes out of my day. I tried a new recipe for a toilet bowl cleaner and not only did it work well but it was fun. The kids enjoyed it too. I was able to get some lettuce, spinach and radishes planted in our garden this week. I am hoping to get some planted in another week so we will have a steady supply of lettuce once it gets growing good. In past years this hasn’t quite worked out that well but I am giving it a try again this year. I picked up my 20 pounds of chicken from Zaycon foods and made 17 freezer meal out of it. It only took about an hour and a half to get the meals made up and into the freezer. It helps that I have done this a few times. I split the 40 pound box with my friend this time. Last time I processed the whole 40 pounds for our family. I prefer processing 20 pounds of chicken at a time it makes the task much less daunting. Plant some radishes and lettuce in the garden. That is my plan for this week. 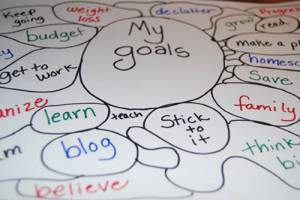 What goals do you have planned for yourself? I want to get back to exercising this week, as well as make a few things for the freezer. We ran out of waffles recently so I need to make some more. I’m hoping to also get to work on the budget as well. I really like having the meals ready to go in the freezer. It makes making dinner on those hectic days so much easier.